It’s been too long! I’m sure you’ve all heard the stories I write on here about Mr Jackson Carle, and his wonderful 8″ scope. Well a complicated series of events have lead to us finding, owning, and in the process of restoring this old telescope. I’ve found photos, magazine articles, the list goes on. The full story to come. 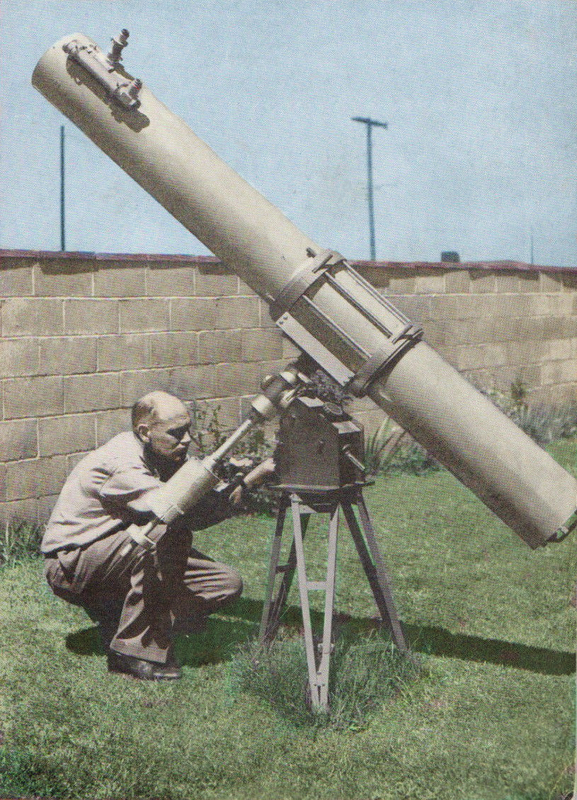 Here is a photo of Mr. Carle and his telescope from 1955. I colorized the photo as it was black and white. This month features a few rather important, exciting events to look out for. March is a great time of year for checking out the winter stuff in the early evening and getting a taste of summer objects in the late night/early morning. In the early evening, expect some nice views of the Orion Nebula, The Messier clusters M36, 37, and 38 in Auriga. Open cluster M35 is northeast of Orion constellation in Gemini. 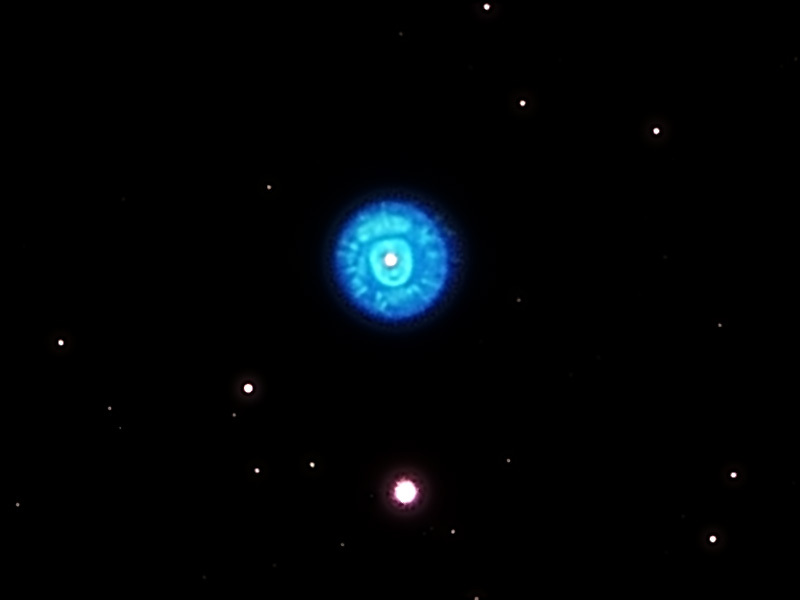 Farther northeast near the main stars Castor and Pollux, have a look at the small, but luminescent planetary nebula NGC 2392. It should be readily visible in a 6 inch telescope. 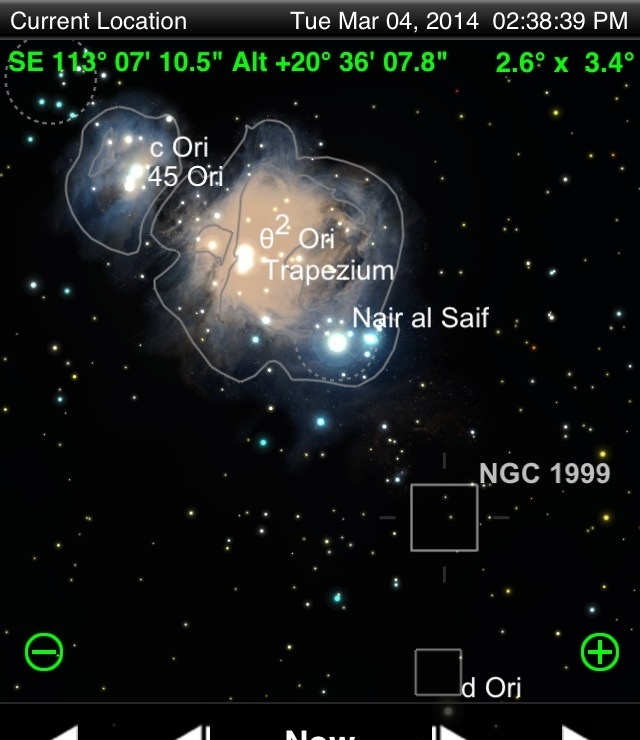 Coming back to Orion, NGC 1999, 10th magnitude nebula faintly connected to M42 is just south of the Sword of Orion. Appears as a faintly glowing irregularly shaped disk with bright central star. M78 is in Orion as well, relatively bright nebula with 2 stars involved in the main nebulosity, a faint fan shaped nebula is seen generally. Of course there’s the Horsehead nebula complex, that requires dark skies and a larger telescope and much patience, I wouldn’t bother with it in the city. However, on very clear nights here in La Verne, sometimes the Flame nebula (NGC 2024) can be glimpsed in the 12.5″ with low power and wide fields. The Pleiades are a great target in most scopes, and for a clear night challenge try for the Merope nebula (NGC1435), faint nebula engulfing the brighter portions of the cluster. Jupiter will make for some nice observing for most of the night, until around midnight it gets lower in the horizon to where atmospheric conditions will detract from the views. The great red spot is showing much more color than in previous years, if you know when it’s visible and what to be looking for, it’s visible even in a 60mm (2.4″) refractor telescope. The M82 supernova, formally designated as SN2014J has passed it’s peak and is slowly fading. It’s brightness is a little fainter than 10th magnitude, still well within limits of amateur telescopes. On March 20th the star Regulus, mag 1.4 in Leo will be occulted by asteroid (163) Erigone and will completely block out the light of the star for a maximum of 14 seconds. If your on the east coast, your in luck. It occurs around 2 AM EST. 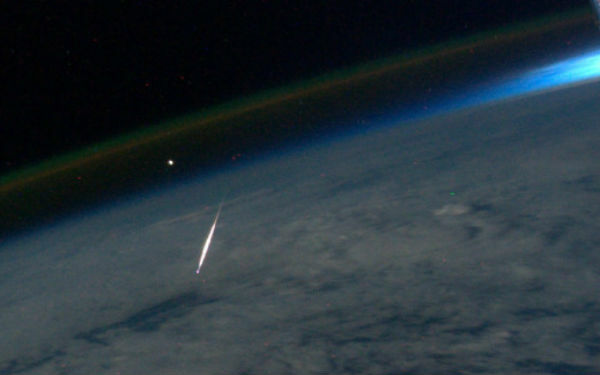 I wish I could see it firsthand; it will be well documented I’m sure of that. All the information is available here. In the early morning, a multitude of objects will become visible. Mars will rise around 9PM and a steady view probably won’t be achieved until more than hour after. Saturn rises at 11PM and a steady view will require more than an hour as well. Ursa Major culminates a little after midnight, the best time to check out planetary nebula M97, and galaxy M108, visible together in a wide vield of view just south of the “bowl” of the big dipper. Galaxies M51 and M63 are in prime spots for viewing, as well as M94 in Canis Vernatici. From 1AM on is a great time for viewing the Coma-Virgo galaxy cluster, located in, you guessed it- Coma Bernices and Virgo. This area of sky is so rich with galaxies it becomes very difficult to identify galaxies within heavily light polluted skies. Dark skies are highly recommended for this area. 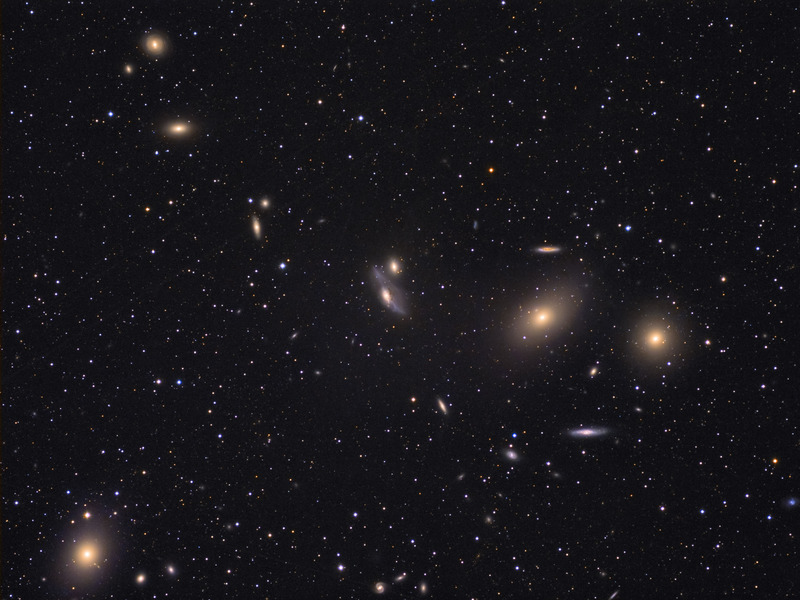 If you can, have a look at Markarian’s Chain, a big “river” of galaxies including the bright Messiers M84 and M87. Many fainter galaxies are part of this and it makes for a wonderful low power view of galaxies. Other galaxies such as M64, M87 and NGC 4565 are all nice to see from this time on. In the south, the famous Sombrero Galaxy, M104 culminates at 1:30AM in the south, located in Virgo about 15 degrees West of the bright star Spica. Seen pretty easily in a 6 inch reflector. Early morning to dawn will give a taste of the summer objects, including the Ring Nebula in Lyra, the Veil Nebula in Cygnus. M13, the famous globular cluster in Hercules should be very good in this time of morning. Messier globular clusters M10, M12, and M14 in Ophiuchus. Scorpio will be up, check out globs M4, M80, M62, M9. 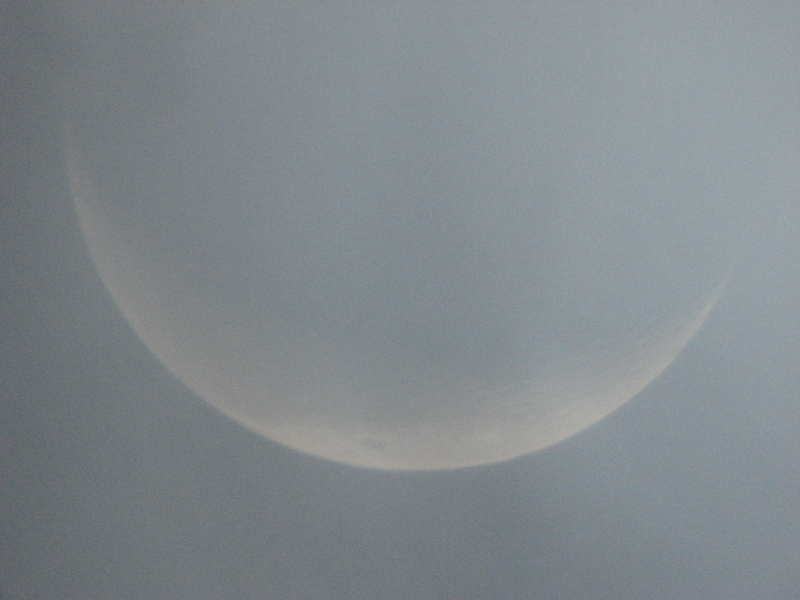 Venus rises at 3:45 and is a bright mag -4.5. 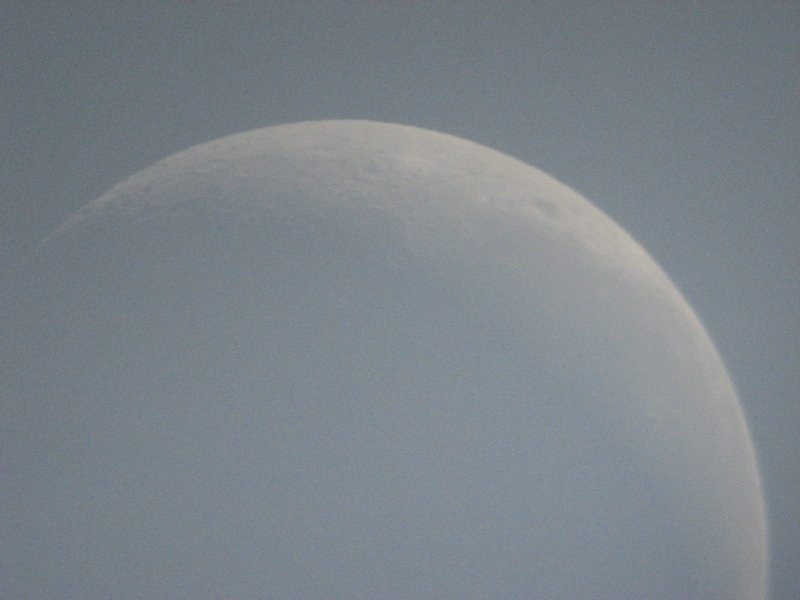 Take note that as the month wears on the moon will be increasing in size, and most early evening objects can be seen undisturbed by even a first quarter moon. Anything past that and it starts to drown out DSO’s. Which only can mean one thing… observe the moon!!! Hope this helps you out in planning your next outing. 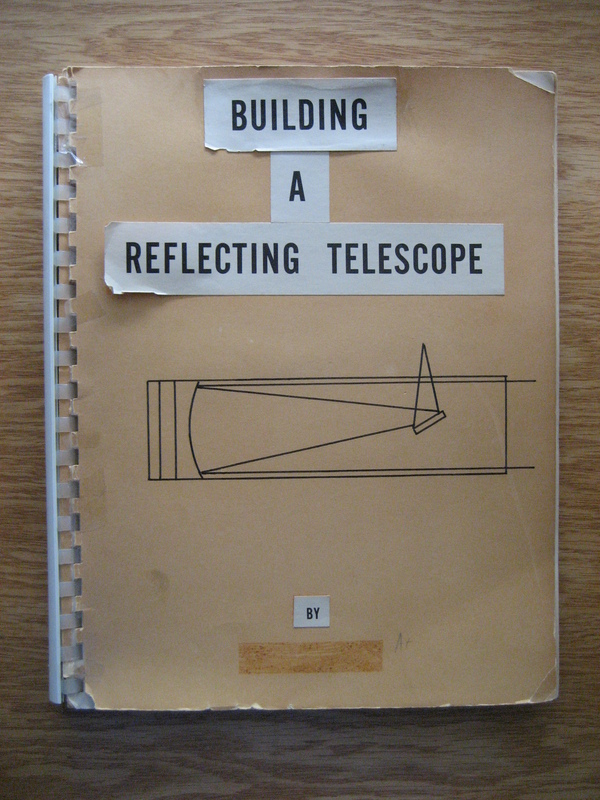 Building a Reflecting Telescope- coming soon! The book I’ve been talking about so much is going onto this blog-site as a page on the left sidebar. You might have seen “About the Author” on there- this will go there. Clear skies. I’ve been kind of bored for the past couple of days and something my dad said made me want to observe the moon. 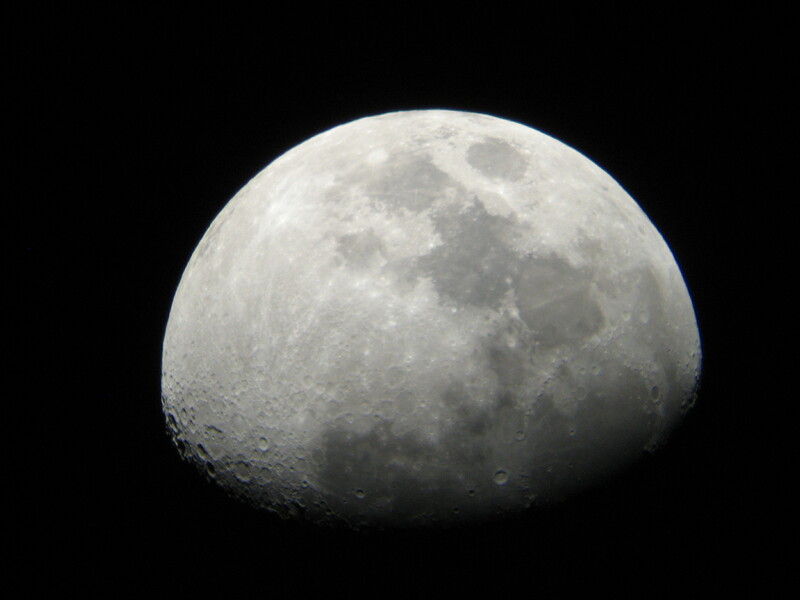 It is certainly not the best time to be observing the moon or any object for that matter, but I was going out anyway. 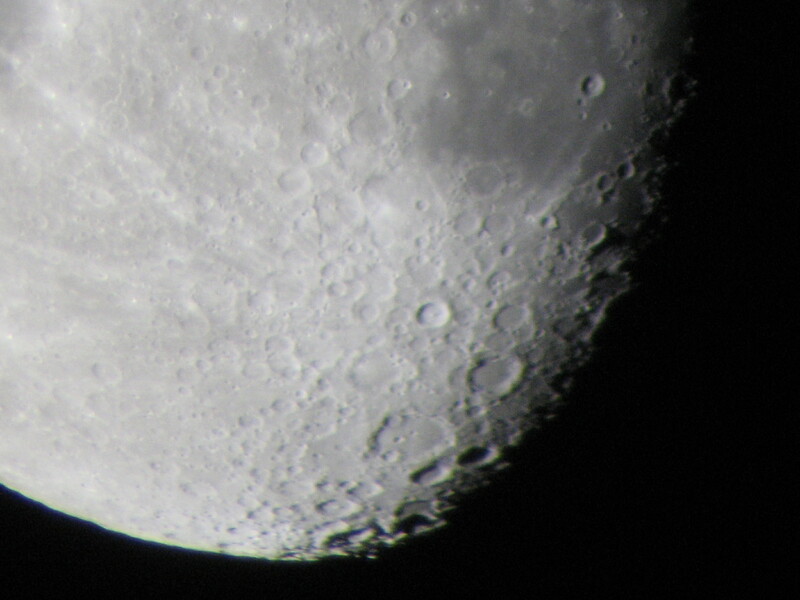 I decided to take out the best lunar scope I have ever looked through, my 70mm refractor. This was my first telescope ever, and I had my eye on it as soon as I flipped through an Orion catalog. It was a $140 scope, and that seemed like a fortune to me, But I bought it and haven’t regretted it since. I decided to set up in my backyard at first, but I moved on to the front yard. We have a rather bothersome floodlight in our backyard and a large luminescent streetlight in the front. Pretty much the only thing I looked at was the Moon, of course. It was not the best of nights, one which I rated a 6-7/10. The camera has a mind of it’s own, and I still haven’t quite figured it out yet. 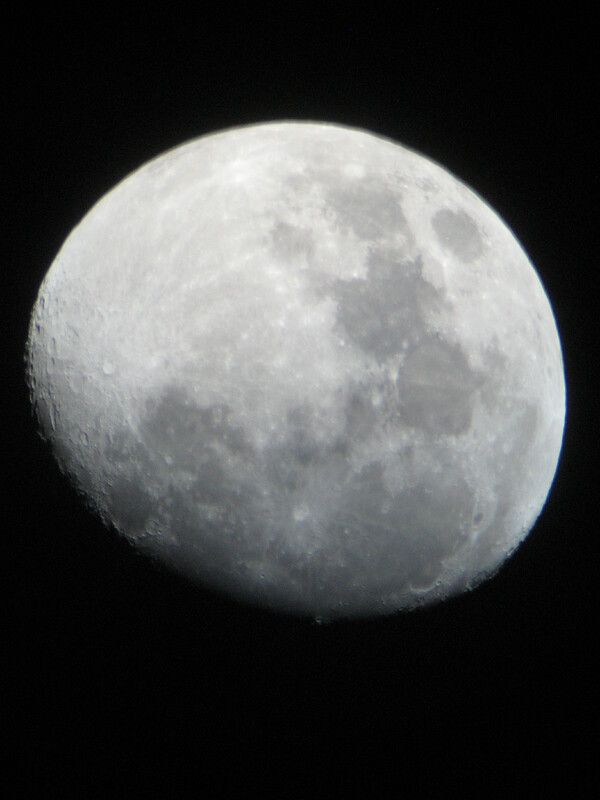 That’s one of the moon shots I took. I tried to post the picture of me looking at the moon with my telescope, but its being stubborn again. If you have looked at the crater Plato on the moon, you might know that there are small craters on the floor of it that are about a mile in length. 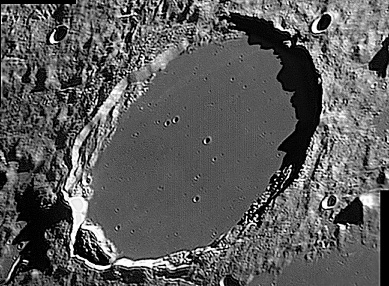 Those craters are a great showpiece in my telescope and I am grateful to have such a good telescope. That was the other “good” picture that night. The turbulence in the air was somewhat prominent, and that certainly didn’t help the picture or the observing. I want to also just post a couple of my recent astronomical sketches, and they have nothing to do with this but I thought they were neat. The one on the bottom left is M27 as seen through the 70mm refractor. Other is M92 through 70mm as well. The night was not very memorable, I moved into the front and fought a war with dozens of crickets and packed it in for the night, thinking I was finished. I watched the Olympics with my family until about 10:30, and went out with my 10×500 binoculars for a minute or 2. 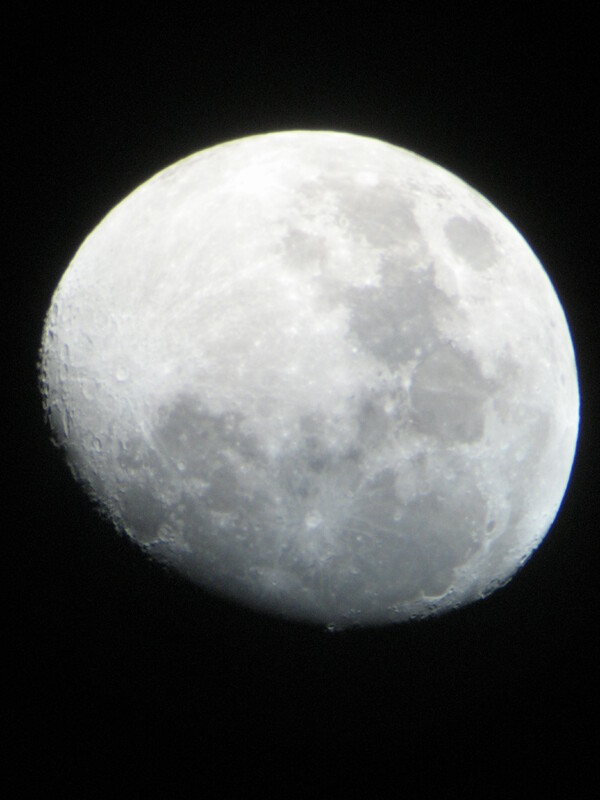 I went back to my room and read Amateur Telescope Making for a long time and went out at midnight. I went outside and it turned out to be a sparkling clear night, even with the large moon. I thought I saw something so I turned my binocs to what I found out to be the M31 (Andromeda Galaxy). I thought it would be there and it was beautiful and bright, even with the 10x50s. I ran in quickly and took out my dad’s Meade 4.5 inch reflector and looked at it. The optical quality is not good and the binocular view was better. The night did turn out to be very memorable. It’s been a while since I ‘ve blogged and I really wanted to get back into it. Now that there is a pretty good moon out, this would be a great time to begin blogging again. I was at the PVAA meeting and they let me borrow their 8 inch loaner scope. They also have 10 and 12 inch telescopes to loan. I was eager to try the 8 inch aperture myself because it had always appealed to me. Another reason I borrowed it is because I didn’t want the guy that brought all the way into the meeting room to carry it back to his car. This time, I can finally post some pictures. I used it for 3 nights in a row, when I first got it. I haven’t been out in about 4 days, so the next scope outing will probabily be my 70mm. Anyway, The scope is homeade and is really easy to setup as well. There are 2 bit parts to it. The first is the mount, which was some crafty DIY work, and the tube, which I believe to be cardboard covered in fiberglass. The telescope is really beautiful, with the spacey blue colored tube and mount. That picture is actually the the second night I took it out, but I took the picture to show the assembly of the telescope. All you do is simply slide it onto the teflon pads. The first night (day) I took it out, I took some pictures of the moon through it. I think at that point, the moon was shrinking in size. These shots were taken around 5:30 in the morning. Those pictures were taken with merely holding an inexpensive digital camera up to the eyepiece. They are not the best pictures in the world, but they are worthy of a few words. This was a homemade telescope, made by somebody in my astronomy club. 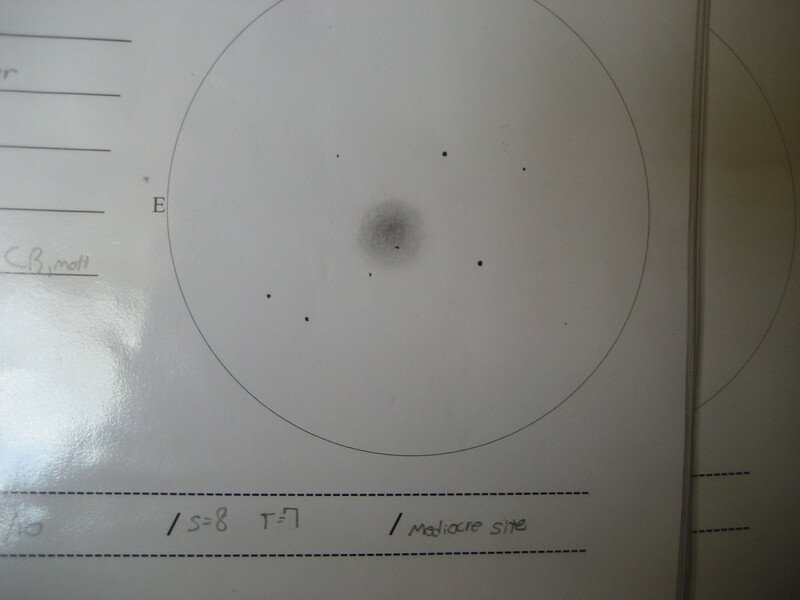 When I got the scope, I got a box which contained 3 eyepieces and a Telrad finder. 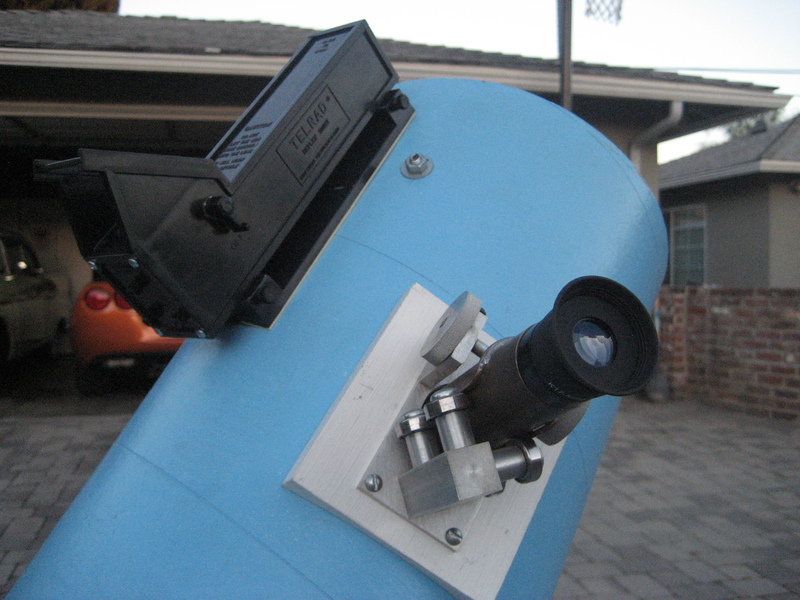 The creator of this telescope also has a homemade 1.25″ focusing device. This is an extraordinary homemade instrument. Here is a close up shot of the “business” end of the 8 inch. At first, I had a little trouble with collimation but then it was brought to rights. The best night I have had since borrowing it was one night with my dad’s 14″ refelctor. It is Orion brand and has tracking and go-to capabilities. 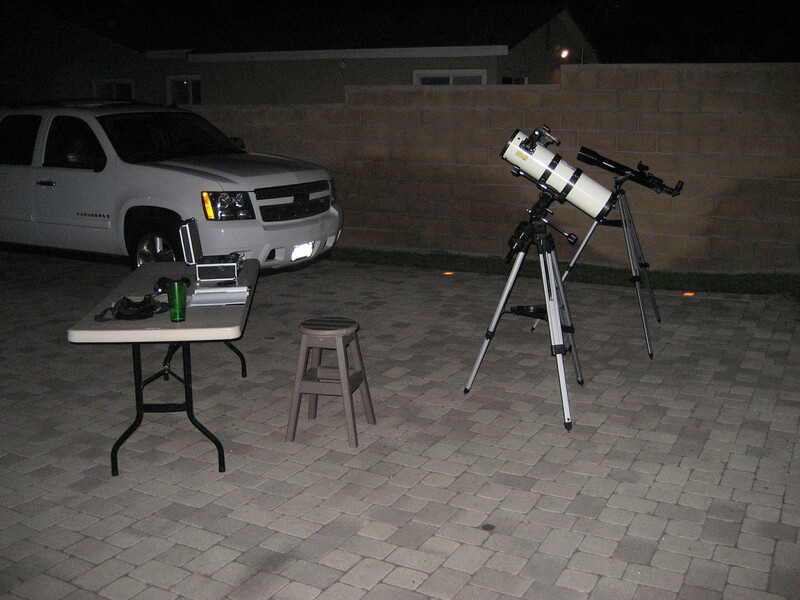 He has started to try more advanced methods of planetary astrophotography, with an imager and the Registax program. For the first hour or so, he was just recording video and taking pictures of Saturn for processing. Later on, he quit the imaging and joined me in some memorable visual observations. 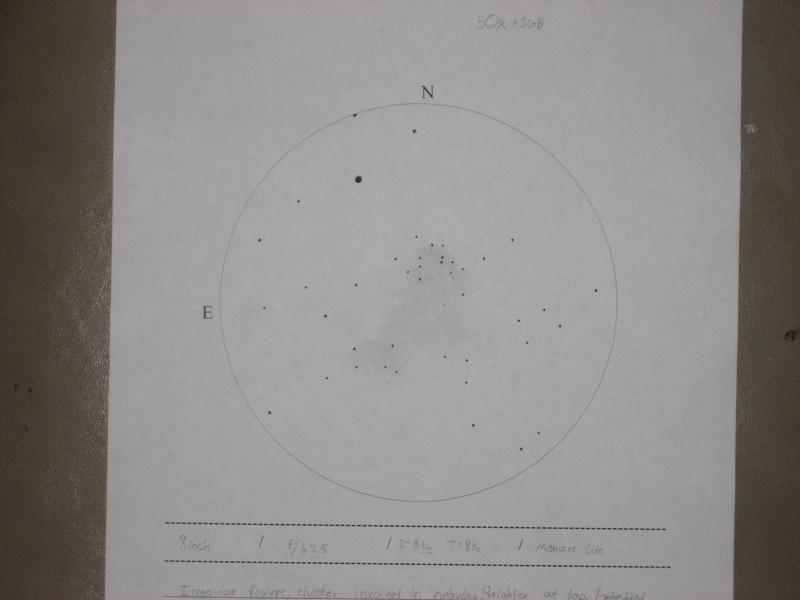 That night, I was primarily concerned with working on my Messier Program, and actually hit my halfway mark with the M4 globular cluster. Much of the viewing was in Sagittarius and Hercules. Living in a heavily light polluted area, it makes this type of astronomy rather difficult, but the persistent observer will still be able to prosper in that kind enviorment. I also took the time to make some sketches through the 8 inch, and like I said on 10minuteastronomy, I will post some of those sketches. These sketches were not very hard to make, but to require some practice. 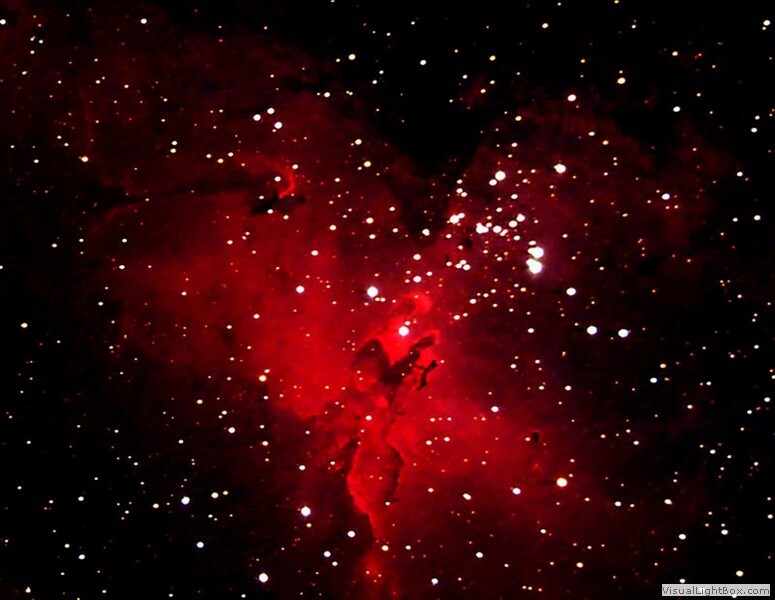 The first 2 is of M16, or the Eagle nebula. The picture on the left is my actual sketch, and the one on the right is a photo. Notice the star cluster at the top of the sketch and it at 2:00 on the picture. that’s all I have time for today. Thank you for visiting and don’t forget to comment! I have noticed on the right sidebar of this blog that there was a significant jump in the views yesterday. From the first 10 minutes of my previous post there was at least 10 views. It brought the total to 79. Now as I am making this post, it is up to 85! I really thank all of you that visit my blog. I would like to hear what you think of it. Please send me a comment at the top of this post by the title. When you comment, you will have to enter your email ( it won’t let me change that). When you do comment, it will be sent to me via email and I will put it on the blog with a reply from me. Anyway, today I’m talking all about books. If you want to become really successful astronomer, you’ll find you accumulate many books. Books about astronomy come in many forms. They vary from subjects suitable for beginners or equations regarding quantum physics. It just depends on what you need or want. For example, in the deep sky observing catagory, I recieved the book, Deep Sky Observing, by Steven R. Coe. He is a very accomplished astronomer and makes gorgeous astronomical sketches. Basically, his entire life’s work is in that book. He uses an array of different instruments as well! 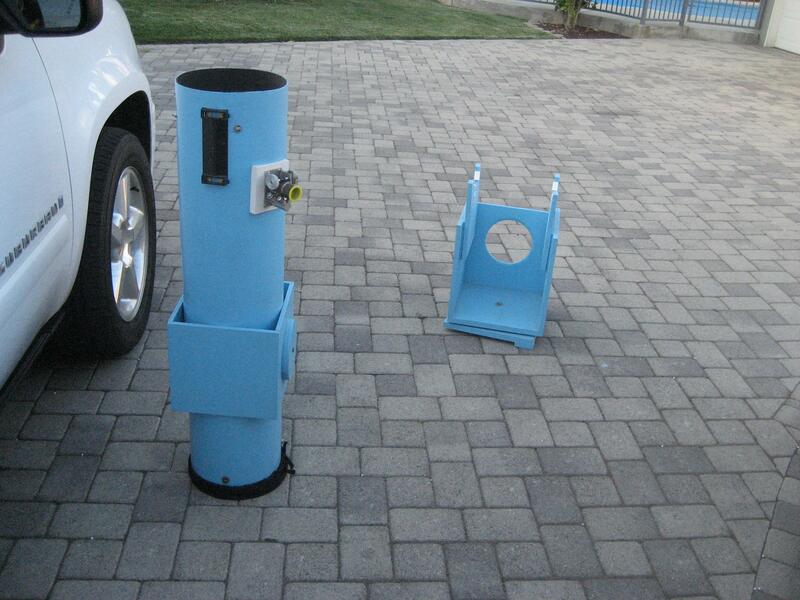 Telescope sizes range from 6inches to 36inches! I is all explained well in Coe’s notes. Highly recommended. One of the best deep sky observing books I have heard about but don’t have is Burnham’s Celestial Handbook by Robert Burnham Jr. It is kind of an old book, but covers the entire sky and shows what to look at. His 3 volume set is one massive work. Steve Coe, recently observed every object in Burnham’s book. There is one more book I would like to share on today’s post and that book is called Universe: the Definitive Visual Guide edited by Martin Rees. The book shares many authors, too numerous to mention. There are 2 versions available, A large hardback edition or a smaller paperback edition. This book covers everything having to do with astronomy. Each page has beautiful high contrast color photos on it. The last 20 pages or so has some exceptional star charts that I have used many times before. If you want a big book covering countless topics, you need this book. All of these books are available through http://www.amazon.com/ and can be purchased reasonably cheap. All of these books are really great for astronomy and you will be impressed with all of them. 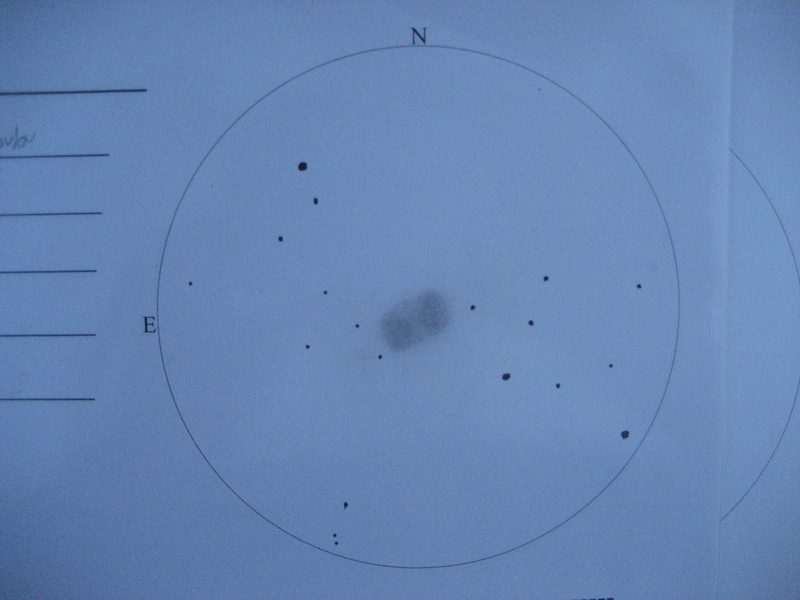 Also, tonight there is an astronomy meeting tonight for my astronomy club, here’s the link again: http://pvaa.us/ I will bring my observing notes and sketches as I haven’t had time to post them on the blog yet. Hopefully sometime soon in the future would be nice.